Social entrepreneurship is emerging as an innovative approach for dealing with complex social and environmental needs, and is an important lever for the development of a sustainable society. Social entrepreneurship and related concepts have had a growing attention in the academy, giving rise to dissimilar approaches in the United States of America and in Western Europe. Despite the importance of the Third Sector in Portugal, it has been difficult to set ideal definitions for social entrepreneurship, social entrepreneur and social enterprises. 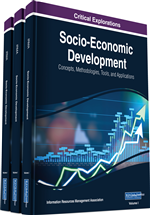 By means of a qualitative study involving four Portuguese social ventures, this chapter identifies contemporary socio-cultural and economic factors that foster social innovation and intervention in Portugal, and contributes to understand the role of social entrepreneur in this context. Social entrepreneurship is emerging as an innovative approach of modern societies for dealing with complex social and environmental needs. As social and economic conditions are constantly changing – and calling for intervention – the opportunities to innovate and become socially active arise in the business arena, in civil society, within non-governmental organizations, or even at government level (Murray, Caulier-Grice, & Mulgan, 2010). In Portugal, the challenges faced over the last 40 years led civil society, governing bodies and Third Sector organizations to develop stronger efforts regarding societal and environmental issues. With the accession of Portugal to the European Union in 1986, a period of economic stability is established and social policies are implemented more in line with European Union standards. However, with recent economic hardship the Portuguese economy went through, the progressive downsizing in the provision of social services by the state has also been a key player in the triggering of such initiatives. Nonetheless, ‘social innovation’, ‘social economy’, ‘social entrepreneurship’ or ‘social enterprises’ are yet foreign topics for many in Portugal, especially in what conceptualization is concerned. Whilst innovation is instinctively connected to technology-based innovation, social entrepreneurship initiatives provide solutions to pressing societal needs that technology, by itself, cannot resolve. This novel form of social innovation and intervention can manifest itself in many different ways to respond to varied phenomena. It may be a product, a process or a technology, a principle, an idea, a law, a social movement, an intervention or a combination of the former ways, among others (Social Innovation eXchange, 2010). Thus, social entrepreneurship presents itself as a new paradigm of social innovation and intervention, a different way of addressing social risks, where everyone participates actively and may become an agent of change (Michela, Robert, & James, 2010). The fact that anyone can be this Schumpeterian agent that triggers change, either individually or in-groups, is also a hallmark of social innovation. The ability to change and innovate is not in the hands of a minority, but available to all, and the information and communication technologies have made people more alert and reactive to societal needs and more easily empowered. It is in this context of social empowerment that a new generation of entrepreneurs has emerged, driven by innovators who are using market-based approaches to solve social problems, fostering the expansion of the social entrepreneurship phenomenon. Social entrepreneurship is, thus, emerging as an innovative approach for dealing with complex social and environmental needs in order to contribute to a sustainable development of societies (CASE, 2008). Research on social entrepreneurship is generally phenomenon-driven and one can consider it is still at its infancy (Dees, 2001). Nonetheless, the growing attention in the last years paid to social entrepreneurship from an academic point of view gave rise to dissimilar approaches in the contexts of the United States of America and Western Europe (Defourny & Nyssens, 2010). Thus, it is essential to understand the basic concepts and propose ideal-type definitions for social entrepreneurship, social entrepreneur, and social enterprise adapted to the Portuguese reality, where most initiatives, by tradition, are in the Third Sector.